This page is dedicated to the books I have written and published for public access. From here, I have provided some external links to the Amazon shopping site where they are available for purchase. It is a beautiful summers day over the field that the harvest mice call home. But unfortunately, this cannot last; storm clouds are gathering, bringing with it the threat of flash floods when the river rises. 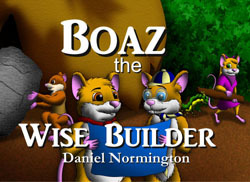 Now Boaz and his pet caterpillar, Chrys, are joined by his friends as they attempt to follow the example of a wise man who built his house upon a rock. At the same time, a local mole named Montague remains stubbornly convinced that there’s no danger. Can a way be found to secure Boaz’s hollow log home? 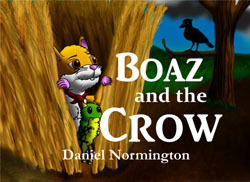 Will Montague’s foolishness land him in hot water?